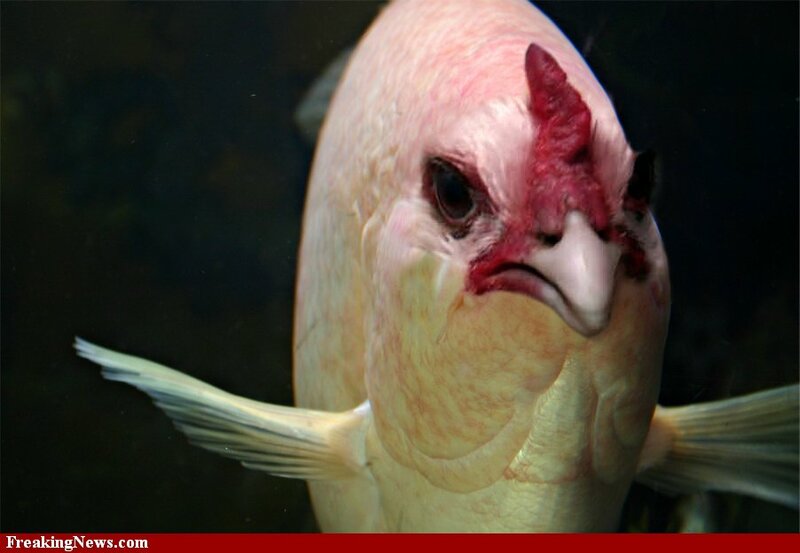 If you search “fish and chicken” in Google images, you get a surprising number of chicken-fish, fish-in-chicken, chicken-in-fish images that range from the oddly realistic to the freakish graphic novel variety. Oh, what a wild world, this realm we call the Internet. So, here’s the thing. My family is pescetarian. You can read about the beginning of, and reasons for, that lifestyle choice here, if you wish. Long story short, I stopped eating all animal flesh in the Summer of 2010, and reincorporated seafood about a year later. My husband has been pescetarian since the Summer of 2011. We typically eat lots of beans, a moderate amount of eggs and seafood once or twice a week. I eat very little dairy, keeping it mainly to plain Greek yogurt for breakfast. Overall, this has been a wildly successful venture. While neither of us set out to lose weight, we’re both a bit slimmer than we were before. Our digestion is better, and we deal with fewer headaches and feelings of general lethargy. In my case, I had little trouble shedding pregnancy weight, and have enjoyed getting the wee one to eat lentils, black beans and eggs in her regular diet. Now, I must say that all of this is not just from cutting out meat. When you don’t eat meat, you rarely, if ever, eat fast food. This means that, in addition to opting for something of higher quality that you make in your own kitchen, you also skip the fries, soda and apple pie that are so easily added to that double cheeseburger order. I also make a habit of getting regular exercise. Going further, we drink more water, and do a better job than before of varying and upping out intake of fruits, veggies and whole grains. It’s not so much meat that is the culprit, but some of the food and lifestyle culture that surrounds it. But there are a couple of quandries that have jumped into my path of diet perfection as of late. Mainly, I’m not so sure about the seafood anymore. Sure, fish, in and of itself, is a great source of lovely things like iron, protein and omega 3s. It tastes wonderful, and can work in pasta, on a bun, next to potatoes and even raw. Seafood was the only animal flesh I really really missed when I was abstaining from all of it. So I hate, HATE the fact that I’m seeing headlines about how 80 some percent of the fish we eat is actually more toxic than is ideal. I also dislike that a lot of convenient seafood comes in cans lined with BPA. Worse, the fishing industry is as horrible to ocean life as some of the farms and slaughter houses are to poultry and livestock. All of this puts me in a mindset that was creeping in right before I went veggie: Eating animal flesh is natural. It provides good nutrition, and helped humans evolve to have the impressive brains that make us so, well, human. There is a food chain, and I respect it. But industry and culture have so screwed up how we raise, harvest, distribute and consume meat, that I do not want to contribute to the cycle any longer. Solution? Only eating meat that is local, free range, organic, blah blah blah. Wait, that’s uber expensive and inconvenient. Hunting? I’m willing to try, but can I really count on my aim? Raising chickens? Apparently not legal in GR, and admittedly more than I have time and space for. Becoming a vegetarian/pescetarian seemed the obvious and easiest choice. And now, of course, we have this fish problem. How maddening. What have we done? I still stand firmly behind my decision to stop eating meat. It’s far too easy to eat too much, and eat meat that is low in quality. I never again want to vote for meat that harms people, animals or the environment with my dollars. Yet, the Northwestern European in me can’t deny how deeply rooted meat consumption is in my humanity. Maybe it’s just because Saint Patrick’s Day is coming, and I know there will be a tray piled with corned beef at the upcoming festivities. But I sense a shift in my thinking, and am now focused on eating in a way that truly reflects the diet that is best suited for my body and my ecosystem. So then. I need more time. I also need more money. I need a clean water source, and a chicken coop. I need a Hobbit Hole in Snowdonia.